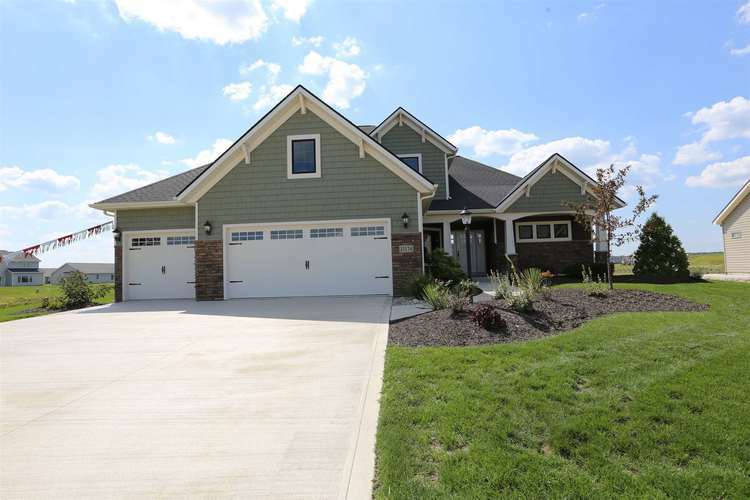 Beautiful new home by Granite Ridge Builders located on a pond lot. Full, covered front porch with beautiful exterior details. Craftsman style interior and exterior with great attention to detail. The main level offers a den with glass french doors and built-in bookshelves. The great room has 12' high ceilings and large picture windows overlooking the spectacular view. Cozy up in the hearth room with a gas fireplace, interior stone details and extensive trim details. Gorgeous porcelain tile fllooring in the kitchen area. The kitchen also has custom maple Grabill cabinets, island with breakfast bar, coffee bar, walk-in pantry 10' deep, tile backsplash and quartz countertops. Just off the garage are lockers and a built-in desk plus a spacious laundry room with additional cabinetry. The main level master suite has a porcelain tile shower, linen closet, double sink vanity and walk-in closet. The second level has 3 additional bedrooms plus a childrens retreat. The full based has stud, wire and insulation plus plumbing for a future full bathroom and set-up for a future 5th bedroom. Directions:State Road 14 to West Hamilton Road. Turn North onto West Hamilton Road. Sienna Reserve is on the left side of the road. House is down on the cul-de-sac.